SunLink started designing solar mounting systems in 2004 when the concept of commercial rooftop solar was novel. The first systems were custom designed for the particular application because everything was new. Needless to say these first arrays were inordinately expensive by today’s standards, but the success of those installations helped pave the way for a booming distributed energy economy. The early rooftop systems were engineered as a single structure where every solar module was linked together, efficiently distributing wind loads. In fact, SunLink’s name was inspired by the structural links holding the system together, which is how our Precision system still works. Solar, however, is relentlessly cost competitive. Smaller installations can’t absorb the soft cost of custom engineering. At the same time, no two solar projects are the same, which on the surface mandates custom engineering. Mass customization can make customization at scale cost effective. I often use Legos to describe mass customization. The Legos are standard, but you can configure the blocks to build whatever you want. Here are a few examples of this approach working in utility solar. Take a single-axis tracker. The tracker needs to be engineered for a wide range of environmental conditions and any row length (since string length varies by project and space constraints require partial rows). This could lead to countless combinations of torque tube lengths and thicknesses. In a mass customized solution, a half dozen or so standard torque tubes are configured to meet the unique needs of the project. Limiting the number of parts greatly increases supply chain and engineering efficiency. Similarly, the number of foundations can be increased to boost load capacity without designing a new part. Cleverly designed module mounting hardware accommodates the most common PV modules with no changes. 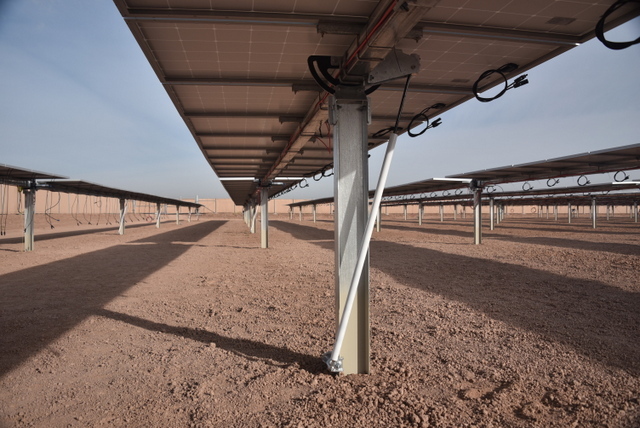 The unique nature of solar sites is designed into products so that manufacturers can respond to opportunities quickly, cost-effectively, and with a fully-vetted solution. SunLink’s TechTrack dynamic stabilization feature is an example, which is a new tool for efficiently configuring resistance to wind loads. Innovative manufacturers are moving beyond traditional racking and into software and services. In doing so the focus shifts from catering to the unique needs of the project to the unique needs of the customer, yet the benefits of mass customization remain. As an example, SunLink recently launched product packages to complement its mounting systems. What differentiates the product packages is that they integrate hardware, software and services to serve a customer’s specific needs. The TechTrack Standard Package, Cold Weather Package and Pro Package allow for standardized solutions for common needs while giving the customer choice in what to pay for. The product packages are analogous to the options available when buying a car. Paint color, drivetrain and interior options cater to different customers, but all are built from the base model car. Mass customization also guides the development of software. Different modules are implemented depending on whether the user is an O&M provider, an EPC or a developer. The best systems are highly flexible with provisions to connect to a wide variety of data monitoring systems, device types, SCADA implementations, etc., because inverters, trackers, storage systems and other intelligent hardware are constantly changing, as are the requirements of the utility and the ISO. Modern communication protocols are critical to strong yet flexible systems. Modbus, developed in the late ’70s and early ’80s, is still the most common protocol for energy devices and SCADA systems. It should be no surprise, however, that a 30-year-old protocol isn’t up to the task of two-way communication between thousands of modern intelligent devices and numerous software services. Worse still, many software packages have limited ability to communicate with other applications. If you want to look at the performance of a solar portfolio but have several data monitoring systems, you may be forced to print reports from each system and manually input the data into a spreadsheet. This is a failure of technology. In tech, RESTful API enables efficient, flexible communication between devices and services and allows developers to build applications leveraging other applications. We’re now seeing APIs used in inverters, trackers, data monitoring systems and initiatives like Orange Button for bankability data to unlock new value in the energy industry. Mass-customized solutions win in utility solar because they drive down cost while accommodating the needs of the project and customer. The next time you are looking at the design of a solar plant, or anything else for that matter, I encourage you to consider what’s led the products to be standardized, customized or mass customized. As Director of Project Management, Patrick Keelin helps define SunLink’s next generation of products and services. His focus includes dynamic tracker design, IoT and the role technology plays in R&D, design and long-term solar project economics.